It is Blogger's Quilt Festival time again! My regular followers have seen this quilt before, earlier this year, but for those of you who are visiting for the first time, hello and thank you for visiting! I chose to feature this quilt for the festival because it is my favorite quilt I have made this year and one of the first quilts that I actually started and finished in a timely manner. Normally it takes me a year to finish a quilt, but this one was done within a month, a new record for me! I won't bog you down with all the details because I have blogged about this quilt before and you can read the extended story of this quilt HERE. This quilt was my entry into the Patchwork Prism Quilt Along hosted by Sweet Diesel Designs, though I didn't place in that contest, I was very honored to be a finalist In the Summer Sewing Contest over at Ellison Lane Quilts, though I didn't win that contest either. Aww... do you feel bad for me yet. Ha, I'm sure you don't and shouldn't because this quilt is a winner! A few weeks ago I entered this quilt into the Cottonport, LA Festival of Quilts and placed first! I was beyond thrilled to see that blue ribbon on my quilt, even though it was displayed sideways (I'll get over it.) It was so nice to receive a ribbon for my work and even more honored to be displayed and judged against so many beautiful quilts. There were 98 entries into the Festival of Quilts and I'll share some of those other beautiful quilts in a future post. The photo above illustrates both the machine quilting that was done around each "prism of solid color" and the hand quilting that was done inside of each prism. I really love the combination of both machine and hand quilting, it gives the quilt the best of both worlds, in my opinion! Size - Wall Hanging 24.5" x 27.5"
Fabrics - No duplicates with the exception of the solid "prisms" and mostly from a 5" charm swap of designer cottons that I participated in earlier this year. Quilting - Machine quilted with tan thread. Hand quilted with pearl cotton in the "prisms", all quilting was done by yours truly. Special Techniques - A combination of machine and hand quilting. I also added four small ribbon loops to the top of the back (sewn in with the binding) in order to hang it on the wall. Be sure to head over to Amy's Creative Side and visit all of the other fabulous entries into the Blogger's Quilt Festival. 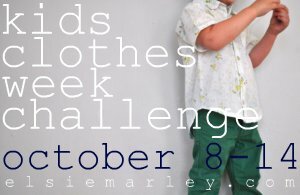 Today is the start of Kids Clothes Week Challenge over at Elsie Marley. Basically you sew clothes for your kids for one hour a day. I have a busy week ahead, so I don't know that I'll be able to devote as much time as I'd like, but I am going to try! I have the pattern, Sewing for Boys, Goodnight, Sweetheart Pajamas. I have the fabrics washed and notions picked out, which is a pretty good start for me. I might actually cut them out today too, which would be amazing. I am going to make a short sleeved version out of the upper pirate fabric since it is a lightweight cotton. The bottom two are flannel and will be a smaller size for my youngest and a larger size for my oldest, both to be worn next winter, not this winter. Preparing for the future folks! I decided to make the same pajamas I showed off lately (the Star Wars pair) simply because they turned out so great and the pattern is fresh in my head and should whip up quickly. Fingers crossed! Hello and TGIF! 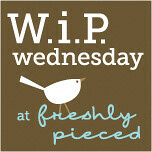 I just wanted to share my little guest posting over at Sew Sweetness this week. You can go to the original post HERE, my contribution to the Tula Pink Sew Along was this past Wednesday. I was so excited to be a contributor in this Sew Along, and so excited to get to make such an awesome quilt for my sweet little boy! Thanks so much to Sara for having me! The photos that are here on my blog today are the "outtakes" from the photo shoot, you know the ones that didn't quite make the cut. To be completely honest, I was really disappointed with this photo shoot all-together. I think that even though I was on a ladder (much higher than I'm comfortable with) the quilt is just too large to fit into the frame well. I think I would have needed to be on the roof! Oh well, live and learn. The wrinkles in the quilt are killing me too, but once again, with a quilt this size I ironed it several times, but the wrinkles just didn't seem to go away. Yuck. What is done is done, right? Below is a shot of my binding all ready to go, I just need to make the backing and quilt it first! HA! I am just thrilled with this quilt and can't wait to finish it up so that it can eventually go on my son's "big boy" bed (I know, I still have a while, he is only 8 months old!) I hope he loves it as much as I do! You still have plenty of time to make an item from a Tula Pink pattern or using Tula Pink's fabric and enter it into the Sew Along contest. You can join the Flickr group HERE and get all of the information and details. There are a ton of great prizes to be had! Go ahead, join and get sewing! It's time for this month's bee blocks! I'm glad to have them done on time... woo hoo! First up is a block for Leanne "shecanquilt" in the Modern Blocks Bee. Leanne asked us to make the "Stonehenge" block, designed by Amy Ellis found on pages 182-183. She sent us fabric from Tula Pink's Birds and Bees line, oh so pretty! I love the simplicity of this block and really look forward to seeing what great modern quilt Leanne creates with them. This block measures 12.5" x 12.5". I will start by saying that these blocks were a little time consuming and on the "harder" scale of blocks, but I will say the effort was worth it and boy these are stunning. "Watch Meesh Run" asked us to create two New York Beauty blocks in the Always Bee Learning group. I think I remember these being blocks number 1 and 7, and you can find the patterns for them HERE. This is going to be an all purple quilt and I think it is going to be FABULOUS, especially since purple is my favorite color, just saying. These blocks measure 8.5" x 8.5", and are paper pieced with the exception of the curves.